Will There Still Be A Classroom In 2020? – How did a dinosaur get in the room? Will there still be a classroom in 2020? How did a dinosaur get in the room? At first glance, this picture may not look much like a classroom. It clearly has some elements in common with today’s teaching spaces like chairs, tables, flat screen displays, as well as students and a teacher. But the students and teacher are wearing something on their heads. And why is there a large dinosaur in the room? The physical classroom of 2020 will not be all that different from today’s classroom. But, the media used for teaching and learning, which had stayed constant for centuries, is now undergoing accelerated change. Likewise, the content being taught is advancing, especially in terms of personalization. Virtual and mixed reality are entering the classroom and bringing subjects to life. Virtual field trips to museums, historical sites, even to past periods in history are now possible without leaving the classroom. Google virtual Expeditions take students on “guided tours of places school buses can’t go.” For the low cost of $11.99 (quantity one, as of this writing) Google Cardboard provides a 3D immersive virtual reality experience to students. Each Cardboard requires a smartphone to function, but almost any Android or iOS phone will suffice. 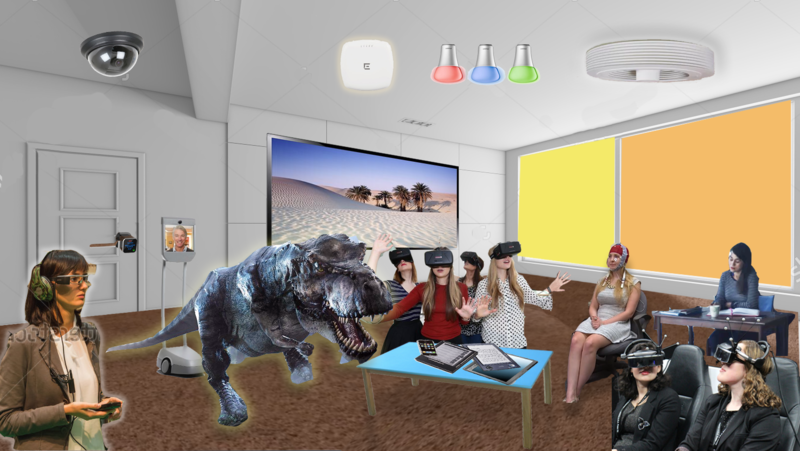 Perhaps even more significant than occasional field trips, are the new possibilities that virtual and mixed reality offer to engage students with traditional subjects. Learners are able to collaboratively interact with virtual objects in mixed reality. They can simultaneously share experiences either while inside the classroom or remotely. The educational content and subject matter being taught today is changing in three ways. First, it is being adapted to take best advantage of the new media; second, it is constantly updated to align with our evolving knowledge of science and history; and third, it is modified to incorporate new methods for effectively teaching traditional subjects like math and language. The components that comprise a traditional textbook date back to 100 BC, when paper was first used in China. It took almost 2,000 years for the printing press and typesetting to make it easier to reproduce books. After another 530 years, digital displays and word processing arrived. Low cost eBooks, such as the Kindle, were introduced 27 years after basic word processing. Now, nine years following the eBook, we have virtual and mixed reality coming onto the scene. Based on this exponentially-accelerating trend in media innovation, the next revolutionary medium may be just around the corner. It’s possible that an entirely new method of communication beyond virtual reality awaits us. Google and Samsung are hard at work on smart contact lenses capable of taking photos and projecting images directly into wearer’s eye. Maybe in the future, images will bypass the human optical system, feeding instead directly into the visual cortex. What are safe predictions for the 2020 classroom? The walls, carpets, and windows will likely be similar to those of today; although there is a more distant vision entailing an entirely-virtual school that completely eliminates the need for a dedicated school building. Similarly, the classroom of 2020 will still need to accommodate eBooks, displays, monitors, and student devices with keyboards. Even if voice input technology becomes much better than it is today, keyboards will still fulfill a need for interacting in noisy rooms. Display devices must be capable of displaying growing amounts of streaming data, including high definition videos, and will require more Wi-Fi bandwidth than ever before. The classroom environment or climate, including room temperature, humidity, CO2 and O2 levels, along with other aspects of air quality can be constantly monitored, controlled, and adjusted to desirable conditions. Need a slightly cooler temperature during a particularly-active lesson? No problem. The same applies to lighting, which can be programmed to optimally match the students’ natural biorhythms, no matter what the actual local weather conditions are on a particular day. Even the smell of the classroom can be programmed for optimal learning during each lesson. The role of the teacher is continuing to evolve from primarily a deliverer of content, to one of facilitator and traffic director, who jumps in when individual students require supplemental help. The instructor can monitor each student’s activities with both video and audio feeds. They can steer the lesson flow by means of a controller. Classroom attendance is automatically updated by means of a camera located near the front of the room. During testing the camera works in conjunction with keystroke recording and realtime answer tracking to prevent cheating. The advent of the Internet of Things is making science class more engaging. Low cost devices like PocketLab and Lab4U that attach to smartphones provide powerful science lab instruments, capable of measuring acceleration, force, angular velocity, magnetic field, pressure, altitude, and temperature. Combine these sensors with robotics and controllers, and students can directly participate in science experiments without being present in the classroom. Hazardous experiments, which in the past would have been impossible for students to watch may now take place in virtual reality. Wearables are having an impact on the classroom. Fitness and heart rate monitor bands provide constant data on student health. Theoretically, teachers could monitor how each lesson affects the students’ vital signs, in order to better understand who is paying attention. Several types of emerging wearables attach to the student’s skull. The Thync module helps reduce student stress and the neural enhancing cap developed by Vanderbilt University boosts learning by stimulating the brain’s medial-frontal cortex. One of the major problems with the proliferation of small personal devices has been the temptation for distraction. Students find it difficult to impossible to resist the lure of an incoming text message. A very interesting side benefit of the head-mounted display (HMD) is that they command 100% of the wearer’s attention. The student wearing an HMD cannot text on their phone. Distraction is completely eliminated. Equally as noteworthy as what to expect in the 2020 classroom is what will be missing. Some of the absent items are relatively minor like incandescent or fluorescent lighting. Efficient Wi-Fi-programmable, multiple-hue LED lighting will take over. Traditional books along with paper and pencils will fade away. The need for printing is gone. Most importantly, the classroom no longer has wires to get in the way, cause tripping, or lead to disruption when they inadvertently become disconnected. In the very near future, all devices will be connected wirelessly, by a robust, high performance Wi-Fi network. One high performance 801.11ac Wave 2 access point provides full coverage bandwidth for the classroom of 2020. The primary uncertainty for the classroom of 2020 is how the infrastructure and devices will be used and what content will travel across it. But that question is up to the educators designing tomorrow’s curriculum. As providers of the technology, we will deliver the best learning environment, one that can animate the most engaging educational content. 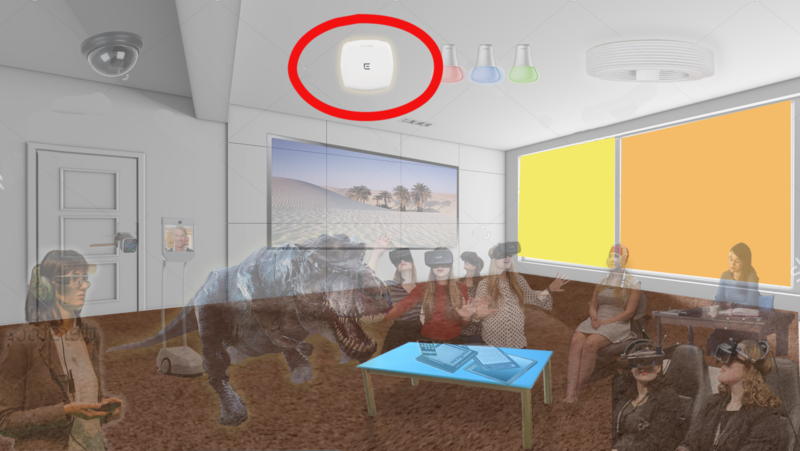 Home › Extreme Networks Blog › Will There Still Be A Classroom In 2020? – How did a dinosaur get in the room?